Volume 7 continues the Hal Roach focus started in Volume 6. However, here, Laurel & Hardy are showcased in a lengthy excerpt of choice scenes from four of their silent shorts --"Angora Love," "You're Darn Tootin'," "Liberty," and "The Battle of the Century." During the '20s, Laurel & Hardy provided Hal Roach Studios with its most successful comedy team. While Keystone comedies emphasized speed and hyperactive motion, Laurel & Hardy emphasized comedy of character. Their comedies relied on the delicate interplay between the two leads. They created carefully modulated rhythms that start out slowly before gradually reaching absurdly frantic peaks. In "The Battle of the Century," for example, a simple banana peel on a sidewalk causes a baker to fall, precipitating a free-for-all that eventually involves everyone within throwing distance. And in "You're Darn Tootin'," an irritated Stan throws Ollie's horn into the street, beginning an hilarious exchange where the entire street is soon filled with men hopping from Stan's kicks. (He delivers vicious and unexpected kicks to the shin.) In "Liberty," Laurel and Hardy ventured into territory frequented by Harold Lloyd. They end up balancing on the girders of a high-rise office building, desperately trying to find their way back down again but only getting further and further into trouble. It's the high-wire antics that most people remember about "Liberty," but the best comedy comes in the setup: when Laurel and Hardy breakout of jail, their accomplice hands them a new set of clothes, but the pants get mixed up. They discover this only after they're already wearing each other's pants, so they must find somewhere to change. They try an alley, but a lady pokes her head out of a window and screams. A cop sees them unbuttoning their pants and he chases them. Eventually, they try changing at a construction site only to discover they are in an elevator headed to the top floor. 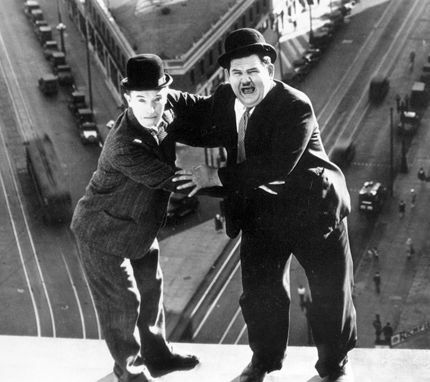 Filmed high above Los Angeles by director Leo McCarey and cameraman George Stevens and utilizing camera angles that enhanced the illusion of danger, "Liberty" is one of Laurel and Hardy's most inventive comedies. Harold Lloyd makes a cameo appearance in "Dogs of War" (1923), an Our Gang short. He had more than a passing familiarity with Our Gang, for Mary Korman (Our Gang's sweetheart) was the daughter of his still photographer, and Jackie David was the younger brother of Lloyd's wife and leading lady, Mildred David. For people only familiar with the Our Gang troupe of the '30s and '40s, "Dogs of War" should prove to be a real surprise, for the Our Gang troupe of the '20s was just as good as--if not better than--their more famous latter day cousins. In this outing, the kids create havoc on a movie studio backlot, with little Farina (Allen Clayton Hoskins) getting them into all sorts of trouble. "It's a Gift" (1923) stars Snub Pollard. After Harold Lloyd left Hal Roach studios, Snub Pollard was promoted to fill the void, and this comedy is one of his best. It's one of my all-time favorite silent era comedies. Pollard plays an inventor with a bevy of Rube Goldberg contraptions. He prepares his breakfast by pulling a selection of ropes over his bed, and he rides to work in a bullet-shaped vehicle that he propels by using a giant magnet. When a car passes in the direction that he wants to go, he holds out the magnet and away he goes, speeding down the road in his bullet-mobile. This short is filled with wonderfully inventive sight gags. "Fluttering Hearts" (1927) is one of Charley Chase's funniest comedies. He performs an hilarious dance with a mannequin while trying to bluff his way into a private club (every man who enters the club must be accompanied by a woman). This is a wildly inventive comedy that serves as testament to Chase's comedic genius. He was one of the great silent comedians. Volume 8 of the "Slapstick Encyclopedia" revolves around Charlie Chaplin. You'll find shorts that feature Charlie Chaplin himself, shorts that star his imitators, and shorts that star comedians who clearly followed in his tradition. This video begins with "A Night in the Show" (1915), where Chaplin re-creates his famous music hall routine. He takes a dual role: as the Pest, he plays a drunkard who tries to find his way to a seat in a theater, and as the Rowdy, he plays a character with a wide mustache who looks more like Snub Pollard or Ben Turpin. The Rowdy sits in the balcony and pours beer on the audience below and throws fruit at the performers on stage. "A Night in the Show" became widely imitated--as this tape testifies, with comedians such as Billy West and Lupino Lane filming short comedies very much in the "A Night in the Show" tradition. "A Night in the Show" contains several inventive pieces of comedy, such as the opening scene where the Pest tries to get a ticket to a concert and he ends up stuck in line behind a statue. However, "A Night in the Show" isn't among Chaplin's best comedies. To find Chaplin at his best, you don't have to look far, though: On this same disc, you'll also find one of Chaplin's all-time best shorts--"The Rink" (1916). It contains several priceless bits of comedy, such as the scene where Chaplin plays a waiter who determines a customer's bill by tallying all the different stains on the customer's shirt. Both of these comedies have previously been available from Kino in their "Early Films of Charlie Chaplin" set. Some people might consider their inclusion here as superfluous, but one of the virtues of this set is its completeness: it provides the best overview of slapstick comedy ever presented on video. This volume also contains a rare snippet where Chaplin comically conducts an orchestra at a New York fund-raiser. In addition to the Chaplin material, "Chaplin and the Music Hall Tradition" includes several additional shorts, including two by Chaplin imitators--Billie Ritchie and Billy West. Ritchie, who was well-established in music halls in the early 1900s, claimed that Chaplin stole material from him. In "Live Wires and Love Sparks" (1916), he stars as a "telephone worker blessed with a large family and a small income." Directed by Charles Parrott (otherwise known as comedian Charley Chase), "He's In Again" (1918) stars Billy West as a bum who tries to sneak into a dance hall/restaurant while Oliver Hardy plays the waiter who consistently throws him out. Also on this disc, you'll find Stan Laurel in "Pie-Eyed" (1925). Before he joined forces with Oliver Hardy, Stan Laurel was Chaplin's own music hall understudy. In "Pie-Eyed," he plays another version of the drunk character that Chaplin created in "A Night in the Show." And in "Only Me" (1929), Lupino Lane (a veteran of British music halls) one-ups Chaplin while assuming the drunk routine from "A Night in the Show" by playing a multitude of characters: he plays the ticket seller, the conductor, a flutist, a female dancer, a baby in a crib, and several other characters.